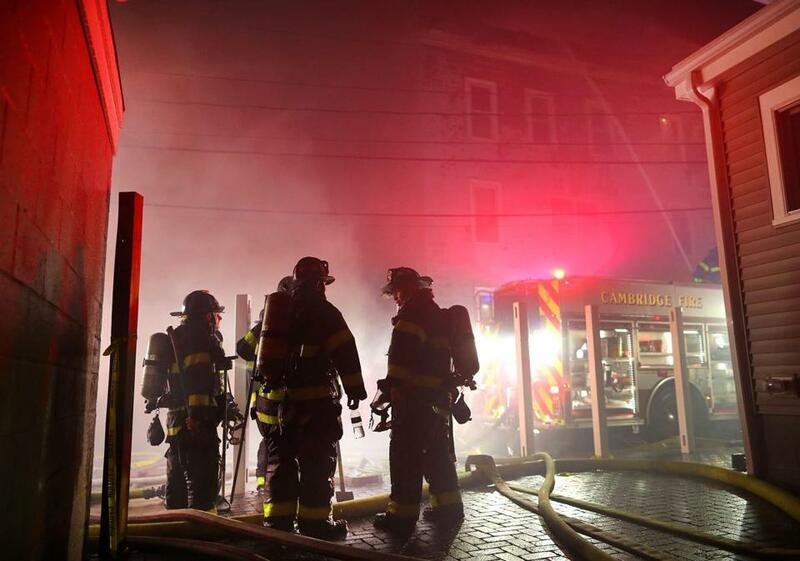 Firefighters battled a 10-alarm fire on Berkshire and York streets in Cambridge on Saturday. 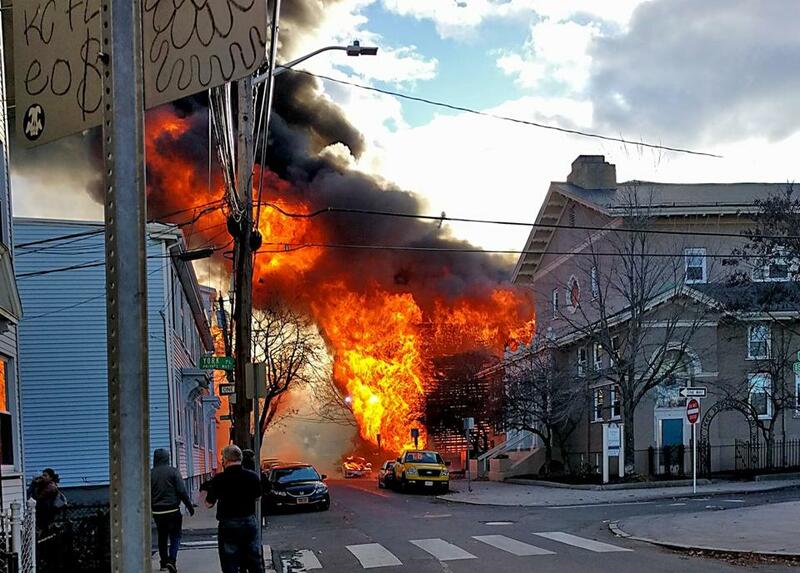 CAMBRIDGE — A 10-alarm blaze erupted Saturday afternoon in a dense Cambridge neighborhood, destroying or damaging at least 11 buildings, and displacing at least 60 people in a conflagration that Fire Chief Gerald Reardon described as looking like a “ball of fire” in war zones. “This looks almost like a third-world country after a bombing,” Reardon told reporters Saturday night. At least one building collapsed before the fire was contained around 8 p.m., authorities said. 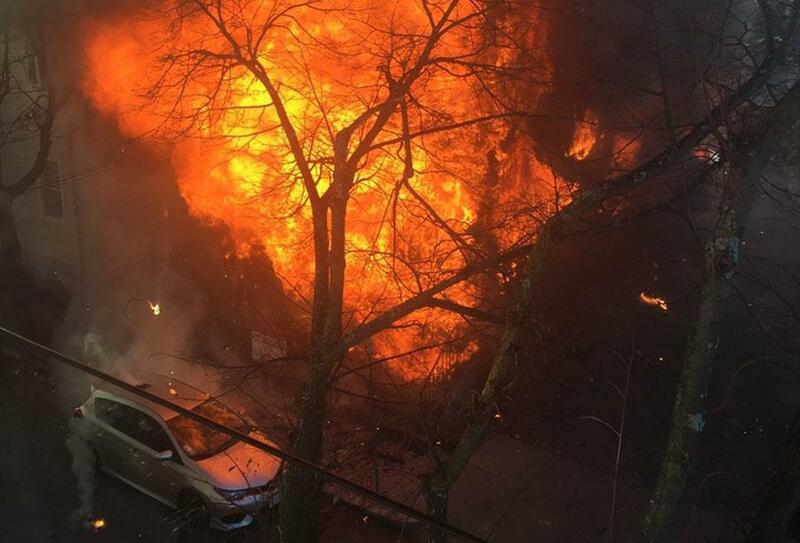 Authorities were alerted just before 3 p.m. as flames began to consume a three-family home that was undergoing renovations on Berkshire Street in East Cambridge, officials said. Reardon said it was a “miraculous situation” that no one had major injuries or had been killed in the fire. The blaze quickly spread, requiring authorities to summon firefighters from nearly 20 communities to contain the fire as it extended to other residences in the area between Kendall and Inman squares, he said. 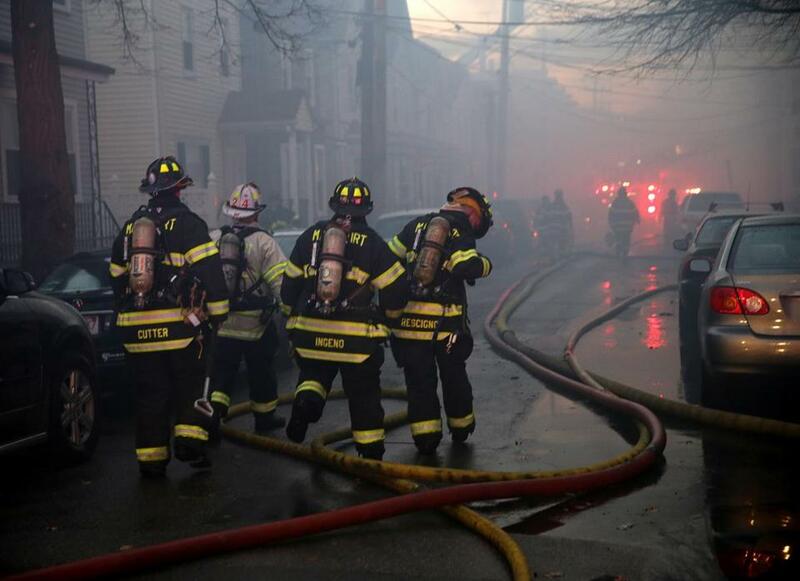 Firefighters from several communities were on scene Saturday afternoon at a 10-alarm fire in Cambridge, where multiple buildings were in flames. 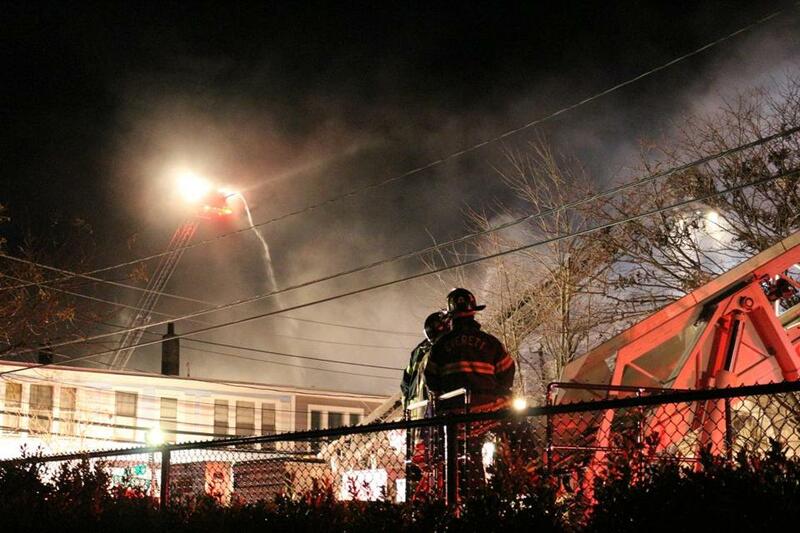 As of Saturday evening, authorities reported fire left five to six people with minor injuries, including a Cambridge police officer and a firefighter who were overcome by smoke and being treated at the scene. He estimated at least 60 people have been displaced. 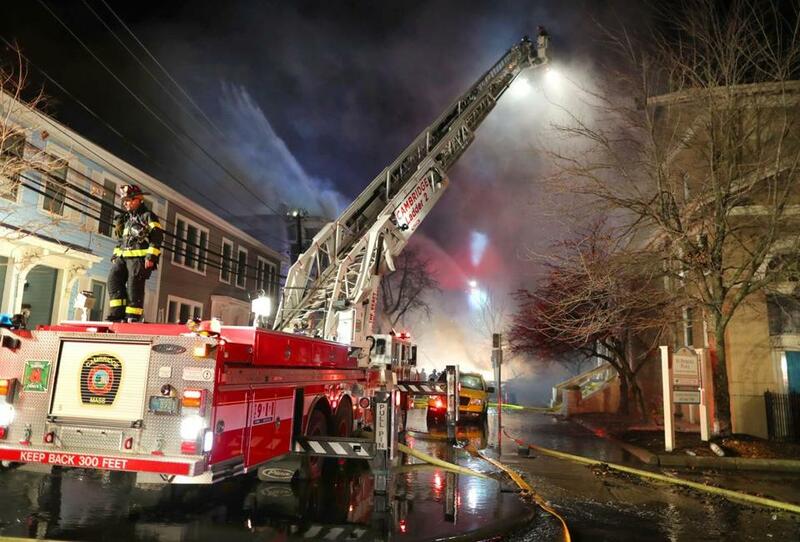 Reardon said firefighters had to negotiate large fire trucks, ladders, and equipment through narrow streets as they tried to fight the flames that damaged a number of three-deckers, vehicles, and a former church building that was converted into residences. Michael Workman, a designer for bostonglobe.com who lives at 30 Berkshire St. in Cambridge, saw flames consume the house across the street from him — and later, his own home as well. The flames jumped across the street, setting the roof of another residence on fire and hurling debris into the wind, he said. About a month ago, workers had begun renovating the home that went up in flames and were working there Saturday morning, Workman said. After leaving his third-floor condo and taking nothing with him, he saw on television flames coming from the roof of his building. He believes everything in his apartment is a total loss. Authorities haven’t determined the cause or origin of the fire, but believe it likely started near the residence undergoing renovations, Reardon said. The building collapsed in the fire. “This is not going to be an easy, quick rendering of a decision,” Reardon said. 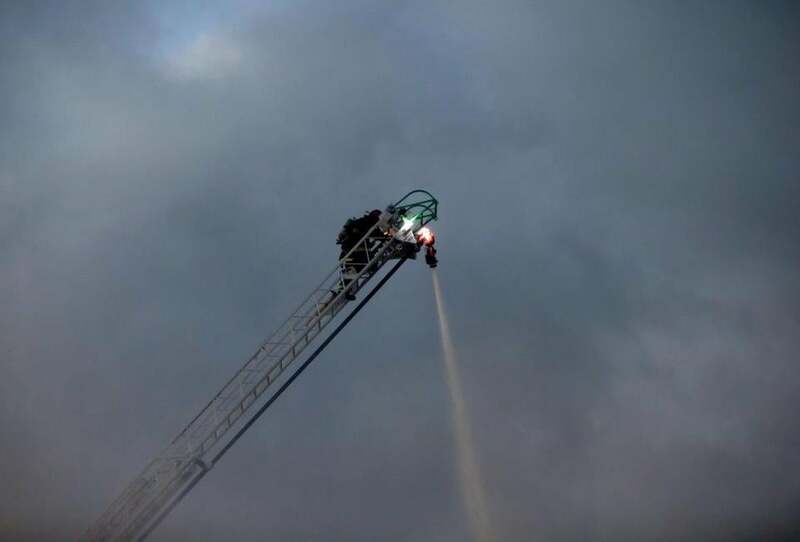 By 6 p.m., he said firefighters were focusing on flames at a three-decker and inside the former church building, now known as St. Patrick’s Place. Just-A-Start Corp., a Cambridge nonprofit, lists the building as one of its affordable apartment complexes for low- and moderate-income residents. Power was cut to the neighborhood and was expected to stay out for a good portion of the night, officials said. The city opened a shelter at Cambridge Rindge and Latin School, according to Reardon. He couldn’t say when residents could return to their homes. 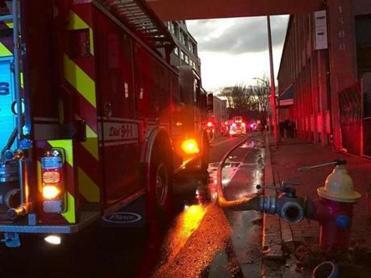 People displaced were also moved to another shelter at the War Memorial Recreation Center where Red Cross assistance would be available, according to a tweet by the City of Cambridge. “It’s going to be protracted for these people,” Reardon said. 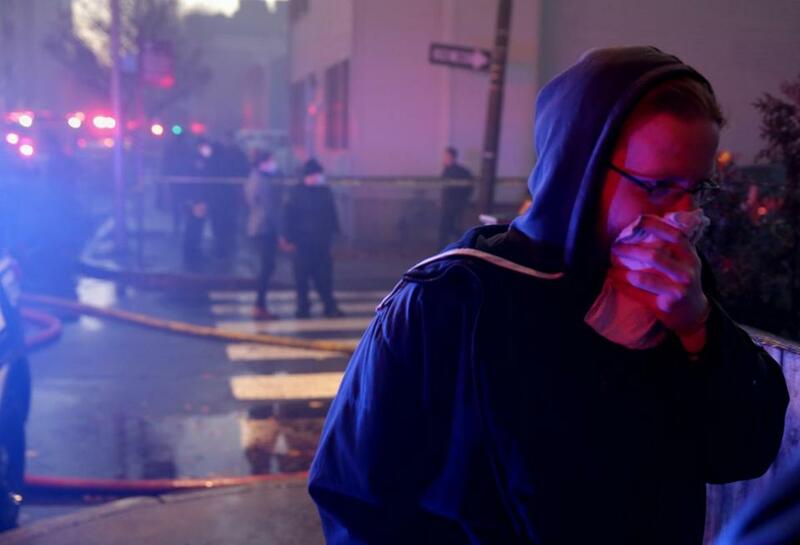 The blaze generated thick, black smoke that rose over the city and forced passersby to cover their mouths with scarves and swat away smoke on Cardinal Medeiros Avenue, blocks away from the fire. 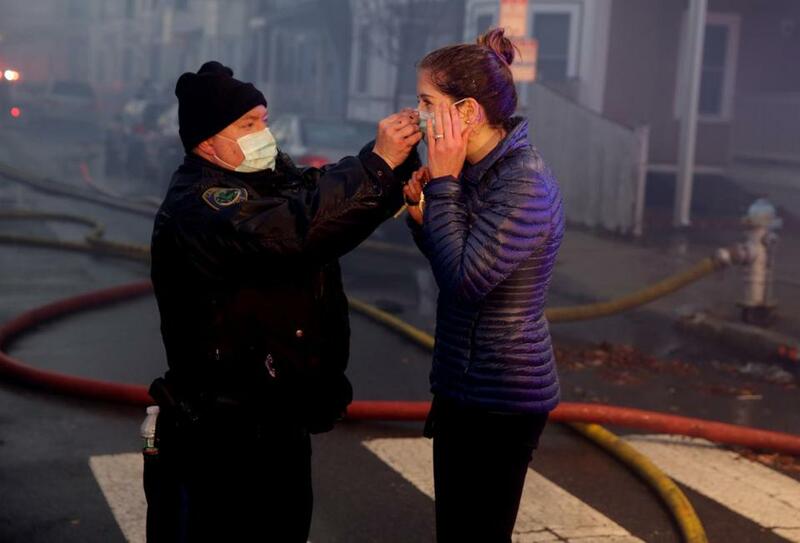 Firefighters also had to contend with winds that measured 25 miles per hour in Boston just before 5 p.m.
At least six fire trucks were parked on the avenue, where thick yellow water lines snake through the road toward the fire on Berkshire Street. Fire crews warned bystanders about the acrid smoke. “Get back, it’s not safe to breathe all this smoke,” one firefighter said. Matt Karolian, director of audience engagement for The Boston Globe, said one of the injured police officers was assisted by a group of firefighters and fellow officers. Eversource had more than 1,600 customers without power as of 7:30 p.m. due to two circuits being taken out of service — one near the initial fire, and a second as the fire spread, according to company spokesman Mal Duffy. While Eversource hoped last night to repair the second circuit within a couple of hours, the first one may take longer if fire or water damage requires a construction crew to get it operational, according to Duffy. Toni Preston, who lives nearby on Plymouth Street, was driving home when she saw smoke from Massachusetts Avenue near Memorial Drive. Standing with her son, Tory Preston-Djamboe, she watched as firefighters rushed toward the scene. “I’m just praying my house doesn’t catch on fire,” Preston said. Preston-Djamboe likened the look of the blaze to natural disasters plaguing the West Coast. “You hear of wildfires and forest fires in California and all that, but this is something you never expect to see on your street,” he said. Social media lit up with concern for those affected by the blaze. Some even offered their homes, including a man who offered for victims to stay for free at his three-bedroom Airbnb near Davis Square, and another who offered rooms in Allston and Melrose. Cambridge Mayor E. Denise Simmons tweeted to thank the community for inquiries about where to drop off clothing and other material goods, but asked that people instead donate to the Mayor’s Fire Relief Fund at City Hall. Lauren Trulik, 22, who lives on Bristol Street, said she attempted to return to her home to retrieve some personal items, but was turned away by fire officials. The scene in East Cambridge. Firefighters were at the scene of a large blaze on Berkshire Street in Cambridge Saturday afternoon. Firefighters headed to the scene. A Cambridge police officer helped a woman at the scene. Firefighters poured water on the fire. The scene near the fire. Globe correspondents Mina Corpuz, Amanda Burke, Adam Sennott, Alex Schroeder, and Martha Schick contributed to this report. Laura Crimaldi can be reached at laura.crimaldi@globe.com. Follow her on Twitter @lauracrimaldi. Nicole Fleming can be reached at nicole.fleming@globe.com. Felicia Gans can be reached atfelicia.gans@globe.com. Follow her on Twitter @FeliciaGans.